Historically, the ancient Egyptian Civilization is divided into three distinct periods. They are the Old Kingdom (3100 B.C. To 2040 B.C. ), the Middle Kingdom (2040 B.C. To 1800 B.C. ), and the New Kingdom (1600 B.C. To 1100 B.C.). 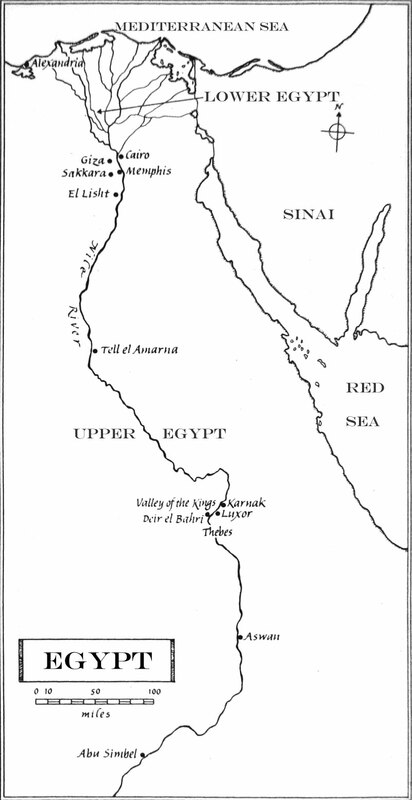 Prior to the establishing of the Old Kingdom, Egypt been divided into two different kingdoms. These two kingdoms were called Lower and Upper Egypt. These people had been attracted to the Nile River Valley by the great abundance of food that the area was capable of providing. At this time, Lower Egypt was north of Upper Egypt. This is because the Nile River flows north. Then around 3100 B.C., King Menes combined both of the kingdoms into one country,and the Old Kingdom period began. Soon after, Menes became the first king or pharaoh of Egypt. He was also the first king of the first dynasty(a series of rulers from the same family) of Egypt. One of the most prominent leaders during the Old Kingdom was the pharaoh named Senefru. Senefru started was historians call the Pyramid Age. Under his reign the Bent Pyramid and the Red Pyramid were constructed. He also constructed the first Egyptian navy. Under his supervision 40 Egyptians ships sailed to Phoenicia (Lebanon) where they sought wood which was in short supply in the Nile Valley. Following the death of Snefru, his son Khufu became the next pharaoh. Khufu erected the Great Pyramid of Giza. He also erected two more pyramid complexes as well as the Great Sphinx. The new Egyptian kingdom expanded greatly until it was impossible for one person to govern the entire country. At this time the capital was in Memphis. The Egyptians created the position of nomach or governor to solve the problem. It was the responsibility of the nomach to report directly to the pharaoh. Before long, the nomachs became resentful and rebelled. Once again, Egypt was divided into two kingdoms. The Middle Kingdom started in 2040 B.C. This happened after King Mentuhotpe reunited Egypt. Mentuhotpe made Thebes the capital of Egypt. These were very prosperous times in Egypt, and several huge public works projects were undertaken. As a result, Egyptians opened up new quarries so they could build more structures. They also harnessed the Nile River by building dams and a reservoir which allowed them to control flood waters. Mentuhotpe invaded Libya, Sinai, Syria, and their trading partner Nubia. Egypt was now trading all over the Mediterranean Sea as well as the Middle East. The Middle Kingdom ended sometime around 1800 B.C. when the Egyptians were attacked by the Hyksos. The Hyksos used horse drawn chariots and swords made out of bronze. The Egyptians only had wooden weapons and were easily defeated. Over the next 200 years the Egyptians acquired their own bronze weapons and were finally able to defeat the Hyksos. This was the beginning of a great period called the New Kingdom or the Golden Age of Egypt. These were again very prosperous times. During the reign of Paraoh Amenhotep IV religion became controversial. Amenhotep forced his people to worship just one god who was named Aten. When he died Paraoh Tutankhamen (King Tut), quieted the uproar by restoring the old gods. The Egyptian Empire started to decline again in 1070 B.C., following a civil war. Over the next few centuries, Egypt was invaded by the Hittites, Lybians, Nubians, Assyrians, Persians, Romans, and Alexander the Great.